Charleston is a great getaway! We met some friends from Canada there & had a wonderful time. I saw your note about the Holiday Inn Historic District. We actually stayed there & had a great experience. The staff was wonderful and the rooms were clean & comfortable. Kevin, the concierge, gave some great suggestions for restaurants, tours and places to see. Two restaurants that we really enjoyed were Hank's Seafood & the Hominy Grill (for breakfast). There is plenty to see in the city and if you wish to venture out of town a bit, there are plantations and gardens galore. We chose to stay in the city since we were there for only a couple of days. 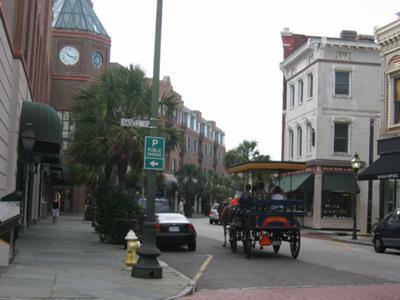 The attached picture is from King Street - a popular shopping area in Charleston. I'm really enjoying your website! It makes me want to take a trip right now!! !